Hi folks! Thanks to all who participated in our giveaway! And thanks to Cor from UPrinting.com for putting it on. 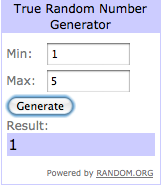 Random.org picked #1 as the winner! Congratulations to Mary from One Perfect Bite!